The object of the beautiful colour of flowers is to render them conspicuous amongst the foliage in order that birds or insects may see them from a distance and be attracted. We call them beautiful because they please us; had it been an advantage to them to have been black and ugly, they would have undoubtedly been so. We are of no consequence to them. They put on their adornments to please beings which to them are of much greater importance. Some plants have very large showy flowers; others bring about the same result by massing together great numbers of small flowers. Silver Wattle has flowers of very small size, yet we can distinguish a flowering Wattle at a distance of some miles. When small flowers are massed together, this occurs in all conceivable forms of looseness or compactness, according to the species. This is sometimes carried so far that the head of flowers look for all the world like a single flower, and in general talk we speak of it as such. A Chrysanthemum, Dahlia, or Aster is a single flower till we examine it, when we find it is really made up of a great number of minute flowers, which we commonly call florets, because they are small. We respect popular opinion, and still call the whole head a flower, though it is not one. Or we may be a little more accurate, and call it a composite flower. Composite flowers appear in many different families; but in one in particular. They are almost universal, and it has pleased botanists to call it the Composite Family, though we must remember that all composite flowers do not belong to it. Tough Bark and Pincushion do not belong to it; but the three already mentioned, together with Daisy, Everlasting, Buttons, Dandelion, and a host of others, do. In order to understand the family we must study the structure of a floret. Unfortunately, being very small, it requires strong eyesight or the use of a lens. Take a Daisy flower, and for preference the flower of one of our common Daisy shrubs or the tree we call Musk. Outside is a close arrangement of green bracts, recalling the appearance of a calyx; its purpose is for protection, and is called an involucre. It varies greatly in different kinds flowers. Here each bract is green, tipped with a coloured point. In Everlasting they are large, dry, and coloured. In Thistles they are tipped with spines. The flower itself shows us a circle of spreading white or mauve rays, and a central cushion of yellow florets. If you carefully cut the flower in two and take out one of the little yellow florets, without injuring it, you will find it consists of a fleshy stalk-like base, which will become the seed. At the top of this we find a ring of long hairs; close inside this is a yellow tube, ending in four or five little lobes. The fleshy stalk is the ovary, and contains one erect ovule; the ring of hairs is a very modified calyx; the yellow tube is the corolla. If you split the corolla open you will find it has attached to its inner surface four or five stamens. The filaments are free, but the anthers are united to form a tube, and they open on their inner aspect. In the centre of the floret is a long slender style; it arises from the top of the ovary, passes up through the ring of anthers, and divides above into two spreading arms. It may be here noted that a flower of the Composite Family may always be told from other composite flowers by the union of the anthers; the others have free anthers. Now, examine one of the ray florets. It differs in the shape of the corolla; instead of being tubular it is shaped like a strap, which is usually toothed at the extreme end to mark the petals of which it is made up; also in ray florets the stamens are generally absent or abortive. The fruit is formed of the slightly enlarged and hardened ovary, each containing one seed. 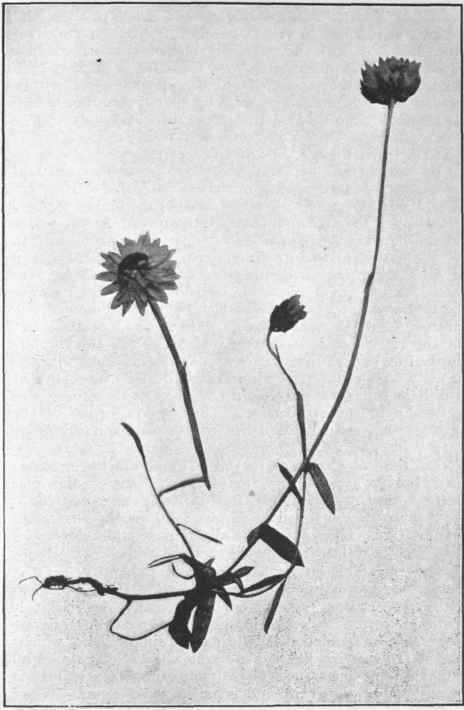 The form of flower, as in Daisy, namely, with an outer ray of strap florets and a disc of tubular ones, is the commonest form met with. In Buttons, a plant of wet localities, with compact yellow flowers, and in the Groundsel of our Gardens, the florets are all tubular; while in Dandelion and its allies they are all strap-shaped. The ring of hairs we have referred to. and called the calyx, varies greatly in different genera. 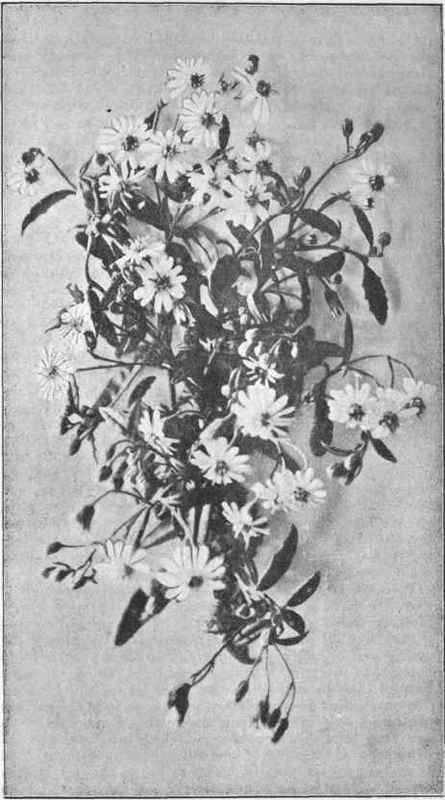 In Daisy shrub it is very conspicuous; in our little mauve Daisies it is reduced to minute teeth; in the introduced wild Daisy it is absent; in Dandelion it is formed of simple hairs, which, in the fruiting condition, are borne upon a long stalk-giving it the appearance of a parachute. The calyx is persistent on the fruit, and is called the Pappus. When well developed it is of much use in assisting the dispersal of the seed. Pollen is shed from the anthers before the style is fully grown. This organ pushes up through the anther ring, carrying the pollen before it, and by the time its branches have spread and developed a stigmatic surface, the pollen has lost its effectiveness. This prevents self-fertilisation. These flowers are most commonly crossed by flies and small beetles, which fly on to the conspicuous head and, walking about, carry pollen from flower to flower. Although we have a great number of plants belonging to this family, there is so much sameness about their general character that they do not appeal to the sympathy of the wild flower gatherer. To the botanist they are of great interest; but then the student is not in quest of beauty. It is the largest of all families of flowering plants, including about ten thousand plants. Strange to say, in Australia it comes only fourth on the list We have far more leguminous plants; next comes Myrtles, and then Proteas. Most of the family are herbs; very few attain the dignity of small trees. The herbaceous condition appears to be more disposed to the formation of variety of form than the arborescent state. Shrubs and trees were probably evolved from herbs, but the reduction to the lower form possibly never takes place. If the gradual evolution of flower forms is also carefully considered, it leads to the conclusion that the composite flower is a very specialised type. These considerations have led botanists to conclude that composites are the latest structure in plant development. It is impossible to come to a definite conclusion, for flowering plants have not developed along one course, but many and independently. Of the many lesser lines there are two large parallel sections developing independently) of one another, the Dicotyls and Monoootyls, and we cannot form any definite conclusions as to which is the older. Among the latter we shall shortly see that the Orchids have certainly attained as high a degree of complexity as have composites. We generally speak of the seed of a plant as though it were the start of a new being - as though it were a new creature called into existence. It is convenient to treat it thus, but not very accurate. 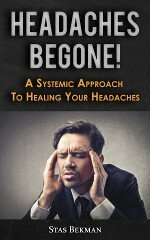 A seed is the outcome of the coalescence of pollen and ovum, and these are nothing more than portions of the plants from which they are derived carrying with them the characters of those plants. They are lineal descendants without break from the earliest organisms that existed upon the earth. Some naturalists are very fond, because bacteria never produce seed, of exhibiting a little bit of marvellousness in claiming that these beings have been immortal as far as the past is concerned. This is quite unnecessary, as the same can be claimed for the cells of every plant or animal; they are all descended without break from the earliest dawn of life. An ovum is but a cell of the plant, within which it is formed. It is a highly complex thing, and possesses hidden within it all the characters of the plant. If it could grow it would develop into a plant practically identical with the one from which it was derived, just as is the case when we raise plants from slips or tubers. If, instead of taking a slip of a Rose, we were able to take one of its cells and induce it to grow, a new exactly similar Rose would be produced. This is the regular course with fungi; they release single cells, which we call spores, and these reproduce beings just like the ones from which they fell. This reproduction of similar forms is called heredity. We speak of plant or animal as inheriting its qualities, and think it strange that one cell can carry so many powers. We should all be in a state of marvellous confusion if it did not. Did no disturbance take place, beings would be the exact counterpart of their parents; but they are never quite that. There is always a tendency to vary, and to account for this tendency is one of those problems that naturalists have not yet come to an agreement upon. It was once thought that if a being became modified by a circumstance of its life, as, for instance, if a man gained great muscular development of his arm by constant use, or a plant formed succulent leaves through the presence of salt, that there would be a tendency to transmit that power; but the weight of evidence is against it. If in the savage state some men had great advantage by accidentally possessing strong arms, there might be a survival of strong-armed men and an extermination of weak-armed brothers; then the tribe would tend to a marked feature of strong arms. 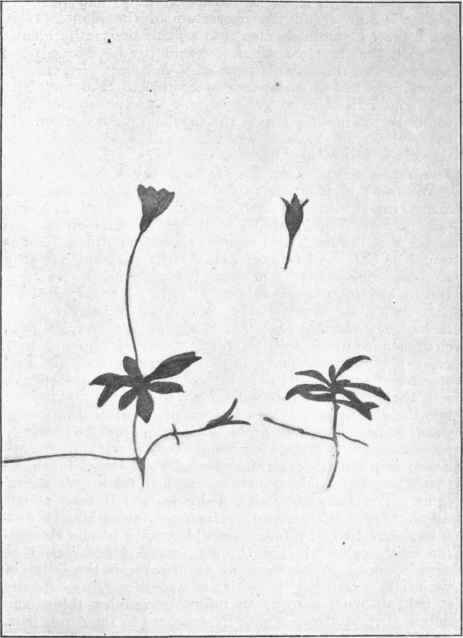 The same way with fleshy leaves; if such a condition gave a life or death advantage, those plants with a tendency to fleshy foliage would survive in the struggle for existence, while the thinner leaved forms would be crowded out. What we want to discover is the cause of variations: the result of it is evolution. As already stated, an ovum is to us an infinitely complex thing, and only if it rigidly corresponds in structure to the ovum from which its parent was formed, will it produce a being of exact likeness. An infinitely minute difference in the result and a variation will appear. Probably every seedling that grows is a variation in some detail; it only requires suitable conditions to establish itself, and possibly eventually produce a new species.